NOW! Christ's Gospel to RUSSIA! FROM BEGINNINGS humble and small without parallel, to the magnitude of today's enterprises and worldwide impact is the story of GROWTH unbelievable! It is the incredible story of something never done before — never done this way — a seemingly impossible achievement utterly unique in the world! By all the criteria of organizational and institutional experience, it simply could never have happened. Every phase of this globe-girdling Work has been something altogether UNIQUE — a first — the blazing of a new trail. Ambassador College is astonishingly UNIQUE among institutions of higher learning. The Plain Truth magazine is utterly UNIQUE in the publishing field. The World Tomorrow program, viewed and heard by millions worldwide on both television and radio, is entirely UNIQUE in broadcasting. And the Worldwide Church of God, behind these global enterprises, is altogether UNIQUE on the earth — practicing, as it does, the revealed ways of the living Creator God, and for the first time in 18 ½ centuries, thundering His all-important Message of the way to World Peace over all continents of the earth. This entire Work has belied all traditional experience. It has reversed accepted procedures. Yet, I hasten to add, these have not been ways of my devising! And since this is the life story of a man, what led a man who had been unusually successful in the world of mammon, with his energy and drive solely directed toward self-gain and status in the business world, to come to reverse his entire life goal and become dedicated to the things of God? Why would a man turn his back on material rewards, and devote his life to GIVING instead of getting? How I came to receive the eye-opening shock of my life, and in due time to be literally thrust into the very last calling and profession I would ever have chosen, was an experience as UNIQUE as everything done since. Coming to the present, why do heads-of-state — kings, presidents, prime ministers of many governments around the world invite personal meetings with a private citizen of my status? Why do governments officially confer highest honors on such a private alien? I repeat, this reversing of trends, ways and procedures has not been that of my devising. As I look back over the years, I can only shake my head in wonderment. I have not done these things — no man could. I cannot take credit. Yet, paradoxically, I have been privileged to have the leading part in these activities. This, truly, is one of the most incredible success stories of our time. There is a very significant reason! For it is the story of what the living God can do — and has done through a very average human instrument, called and chosen by Him — one whose eyes He opened to astonishing truth about the real cause of the troubles and evils heads of governments face, and the way to World Peace — one He reduced to humble obedience, yielded in faith and dedicated to God's way! God promises to prosper His own Work. And HOW GREATLY He has blessed and prospered it! Like the grain of mustard seed, it GREW! — and GREW! Ask yourself: What company, business, enterprise or institution in this world's ways, ever experienced a steady GROWTH averaging nearly 30% every year for decades? Most commercial businesses and enterprises do well to hold about even over the years. But a growth averaging 30% every year, regularly and steadily, for decades? It must be a record unmatched. It meant doubling in size and scope and power every 2 2/3 years. It meant multiplying itself in size eight times in every eight years, 64 times every 16 years, 4,096 times in 32 years! Most, if not all major corporate institutions began with sizeable capital. But this worldwide Work started giving — (reversing objectives and procedures) with absolutely no financial capital! These globe-girding enterprises included the founding and operation of a co-ed college in the field of the liberal arts and humanities. I'm sure anyone experienced in the administration of a private-owned college would say: "No one could start to build such a college without money, endowment, government aid, or grant from any foundation, making no appeal to the public for financial support, and build such a college, of outstanding quality and beauty with the most modern facilities, and in so doing gain an enviable financial status recognized by major banks in New York, Philadelphia, Los Angeles, London and Geneva. IMPOSSIBLE!" But much more! In every way, Ambassador College is unique. In magnificence of its campus — in the tone and character of its buildings and grounds — the physical setting in which it has produced tone and character in young men and women — Ambassador College is certainly unique in a world where education has drifted into materialism. Ambassador has dared to recapture the TRUE VALUES; to restore the most necessary MISSING DIMENSION in knowledge; to become a cultural character-building institution, concerned with moral, spiritual and ethical values as well as with the intellect. It started without money — with four students and eight members of faculty and administration. There have been no protest marches, no friction between students and faculty and administration, no hippie-type students. Ambassador is indeed UNIQUE! These enterprises include the World Tomorrow television and radio broadcast, aired weekly in nearly every market throughout the English-speaking world and in numerous other areas worldwide. There is no solicitation for financial support. The programs are UNIQUE in the broadcasting field, with worldwide impact on MILLIONS! There is The Plain Truth — a finest quality mass-circulation magazine in full color in seven languages, with about eight million copies monthly. This, alone, would rate as "BIG BUSINESS" if it were a commercial profit-making operation. But this enterprise was built, starting without capital, without advertising revenue and without subscription price income. It is indeed UNIQUE in the publishing field. Also there are other publications, including The Bible Correspondence Course issued monthly, with scores of thousands of students enrolled; the Good News magazine and a Youth magazine. There are scientific expeditions, in association with the Leopold III Foundation for the Exploration and Conservation of Nature. This Work, further, has been engaged in large-scale archaeological projects in joint-participation with Hebrew University of Jerusalem and with the Japanese government; with other institutions in Syria, as well as cultural and humanitarian projects in Southeast Asia, the Kingdom of Jordan and in Africa. Yes, truly, this has been "Mission Impossible" — ACCOMPLISHED! And still being accomplished in ever-increasing magnitude! It has been and is, as stated above, an example of what the living God can do, has done, and is doing through human instrumentalities yielded to Him and obedient to HIS WAYS! I had been, over wide areas, conducting surveys on conditions and trends. I was greatly concerned over learning that most people are not happy — the world is full of evils. But WHY? My surveys revealed the worsening conditions, but not the cause. Nor could it be found in science, nor in education, nor in government, nor in religion. In the autumn of 1926, my wife said she had discovered, in the Bible, a God-ordained WAY OF LIFE — a way contrary to accepted Christianity. It became controversial. I was challenged into the most intensive study of my life. I had been born and reared of upstanding and stable parents of a traditional orthodox Christian denomination. I had never had any particular religious interest, and by age 18 I dropped out of Sunday school and church attendance. I assumed, as probably do most, that the denominations of traditional Christianity had received their beliefs and doctrines from the Bible. I had always said, "I simply can't understand the Bible." But now I set out to prove, by the Bible, that "all these churches can't be wrong!" Soon I encountered the most astonishing shock of my life! I was shocked to discover not only that traditional Christianity taught contrary to the Bible — that the Christian religion, with more adherents than any religion, did not, as I had supposed, get its teachings from the Bible, BUT that the Bible contained teachings and revelations of facts not known or taught by any religion. It was amazing! I began to see plainly, in the Bible, that what I had been taught from childhood was primarily the very opposite of what the Bible teaches in plain language! At first I was confused. My head was swimming! My foundations seemed to be crumbling beneath me. Simultaneously I was making a renewed in-depth study of the theory of Evolution. I was researching it and at the same time the Biblical claims of special Creation. Was there a God, after all? What could a man believe? It was, for a while, a frustrating dilemma. Gradually, as these months of 12- to 16-hour days of study progressed, the real truth began to emerge. It didn't come easily or quickly. It required effort, zeal, determination, patience. And above all, a willingness to confess error when proved, and to confess truth even against my own will. I did find absolute PROOF that the Creator, God Almighty, exists and RULES the universe. I found many proofs of the inspiration and authenticity of the Bible. And I found the CAUSE of all this world's ills, as well as the solution that will be made — if even against the resistance and opposition of humanity! I found the MISSING DIMENSION in KNOWLEDGE — what man is, why man was put on earth — the PURPOSE for which we were made alive. I found THE WAY that was set in living motion to CAUSE and produce PEACE, HAPPINESS, ABUNDANCE! I found what neither science, religion, nor education has revealed — what had been overlooked, though available. And IT ALL MADE SENSE! I found THE REVEALED ANSWERS — rational, obvious answers — to humanity's problems, troubles and evils. Answers not found in science, education, government nor religion! And I found that the very GOSPEL — which means good NEWS — brought to the world by Christ had for 18 ½ centuries been rejected or ignored by that world! How all this came about is the story of an experience as unique as it was heartrending and difficult to go through — for it became a battle against my own self and my human — my very human nature. In the end, I lost that battle in an unconditional surrender. And the incredible accomplishments in which I have been privileged to have the leading part, have been the result. Sometime ago, a leading American news magazine, reviewing the frightening state of today's world, commented to the effect that it would seem the only hope for human survival now lies in the intervention of an unseen "Strong Hand from Someplace." What has been developed in such astonishing manner in this Work is directly creditable to the direction, inspiration, and empowerment of that "Strong Hand." It is a historic fact that many times the unseen One has prepared in advance those to be used as His instruments for getting His purpose accomplished. In my personal case, looking back in retrospect, I have felt that the advance preparation, even from childhood, was a thrilling succession of unusual and intriguing experiences. Thousands have requested that I write the details of those experiences. Too often, it seems to me, leaders in science, in government, or other fields of activity hastily ask only, "How soon can we?" instead of "Should we?" I did ask myself, should the story of my life be written and published? For some time, I felt it should not. I felt it was my responsibility to get on with getting the job done, not to talk or write about myself. But when listeners, viewers and readers ask to know what's back of this Work — how it started, what led to it, how it has been done — I came to realize they have a right to know. As a young man I read Benjamin Franklin's Autobiography three times — over a period of a few years. It had a considerable impact and influence on my life. I owe much to having read it. The reading of life experiences of many other men, whether biography or autobiography, have been of great value and inspiration. There was the autobiography of Bernard Baruch, biographies of George Washington, Abraham Lincoln, Theodore Roosevelt and many others. Then there was the Apostle Paul, a man of God, who told his life experiences, recorded in the Bible. The first four books of the New Testament consist, primarily, of those portions of the life-story of Jesus helpful to the reader. The Old Testament is replete with biographical sketches of the life experiences of many men — Noah, Abraham, Isaac, Jacob, Joseph, Joshua, Samuel, David, Elijah, many others. I came to realize that the recording of one's life experiences can be inspiring and helpful to others — provided there has been something of real value in those experiences. The influence exerted on me by personal association with numerous leaders among men, in business, industry, education, government, and by reading of such lives, played their part in carrying me through an eventful life, filled with interesting, exciting and unusual experiences. They have helped solve problems, meet difficulties, sorrows, sufferings. They have contributed also to successes, and the joy of participating in great accomplishments. And now, looking back on a long life well filled with action, effort, travel, important personal meetings with the so-called great and the near-great, many world leaders, kings, presidents, prime ministers, educators, industrialists, heads of great banks, scientists — a life replete with exciting events and unusual experiences, I feel that the recording of all this might impart some measure of inspiration and help to the reader. For one thing, I had felt, years ago, that the story of these experiences might be helpful and of value to my two sons. Benjamin Franklin addressed his Autobiography to his son. But there never seemed to be time to write it, just for them. But after so many radio listeners and Plain Truth subscribers requested the background facts, it seemed that I owed it to them, and I decided to write it in serial form, an installment each month, in The Plain Truth. 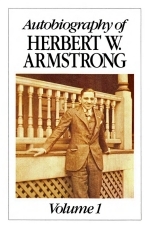 Consequently, the Autobiography began appearing with the September, 1957, issue. It is my sincere hope and desire that the reader will be helped to a richer, fuller, more abundant life by this Autobiography.